A 42-year-old man from Afghanistan was referred to hospital as a case of non-resolving pneumonia. He had fever and productive cough of thick white sputum for 4 months without response to antibiotics. There was no history of haemoptysis, sick contacts, recent travel, weight loss, substance abuse or HIV risk factors. He was a non-smoker with unremarkable family and environmental history. On examination, he was febrile (temp=39.1°C) with stable haemodynamics. Oxygen saturation was 96% while breathing room air at rest and finger nail clubbing was absent. Chest auscultation revealed bronchial breathing on the left upper lung zone. The rest of his examination was unremarkable. Except for mild neutrophilic leukocytosis, complete blood count (CBC) was unremarkable. Moderate elevation of erythrocyte sedimentation rate (74 mm first hour Westergren) and C reactive protein (92 mg/L) was noted. Biochemical profile showed normal serum electrolytes, hepatic and renal status, total proteins, albumin, uric acid, and lactate dehydrogenase. Urine analysis showed no abnormality. CT of the chest showed cavitating consolidation of the left upper lobe without lymphadenopathy or effusion (figure 1A). Routine sputum analysis was inconclusive. Flexible bronchoscopy revealed a greyish white gelatinous membrane in the anterior segment of the left upper lobe (figure 1B) and bronchoalveolar lavage microscopy showed membrane fragments with parallel striations (figure 1C). (A) Axial CT scan of the chest at the level of the carina (mediastinal window) showing cavitating consolidation of the anterior segment of the left upper lobe (arrow). (B) Endobronchial still image showing a thick white membrane occluding a distal airway orifice in the anterior segment of the left upper lobe. (C) Isolated fragments of laminated membrane (arrows) appearing as delicate parallel eosinophilic striations surrounded by inflammatory cells (H&E×40). Answer: Complicated pulmonary hydatid cyst. 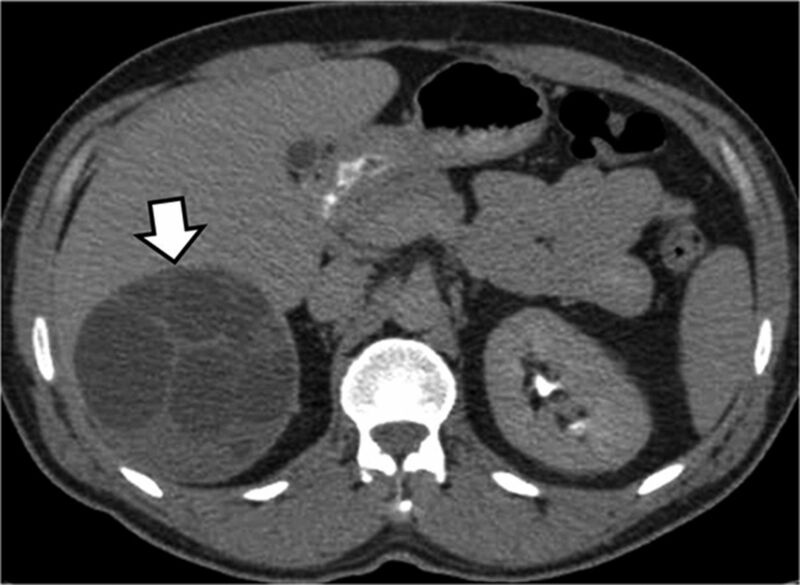 The diagnosis was further confirmed by finding typical liver cyst on CT (figure 2) and positive serology. The patient declined surgical interventions and was maintained on albendazole. Follow-up at 3 months showed almost complete radiological resolution of the consolidation. CT scan of the abdomen (delayed contrast phase) showing a large, round, cystic lesion of the liver with multiple lobulation, characteristic for hydatid disease. Hydatid disease is caused by the larval stage of Echinococcus, a tapeworm that usually affects dogs. Humans contract the disease by ingestion of eggs in contaminated water or from close contact with dogs.1 The liver is the most common organ affected followed by the lung. Intact pulmonary cysts are often asymptomatic and typically appear as round or oval lesions with smooth borders.1 When the cyst becomes infected or ruptures, the radiological appearance may become atypical and can mimic non-resolving pneumonia, abscess, TB or lung tumours.2 Cyst rupture can manifest as acute hypersensitivity reaction or anaphylaxis. The diagnosis of pulmonary hydatid disease is primarily based on clinico-radiological findings with CT being the preferred modality. Serology has a supportive role with a sensitivity of about 50%. Bronchoscopy seems to be a valuable tool that is underused. The finding of whitish-yellow bright gelatinous membrane inside the lumen of a bronchus can be an immediate clue to the diagnosis3–5 which can be further confirmed by microscopic examination of bronchoalveolar lavage or biopsies. The main therapeutic approach for pulmonary hydatid disease is surgical removal, usually with preoperative use of albendazole to reduce the risk of parasite seeding and recurrence. For pulmonary cysts that are not surgically resected, prolonged use of albendazole is warranted.
. Pulmonary echinococcosis. Eur Respir J 2003;21:1069–77.
. Unusual imaging characteristics of complicated hydatid disease. Eur J Radiol 2007;63:84–93.
. Value of fiberoptic bronchoscopy in the diagnosis of complicated pulmonary unilocular cystic hydatidosis. Eur Respir J 1997;10:811–14.
. 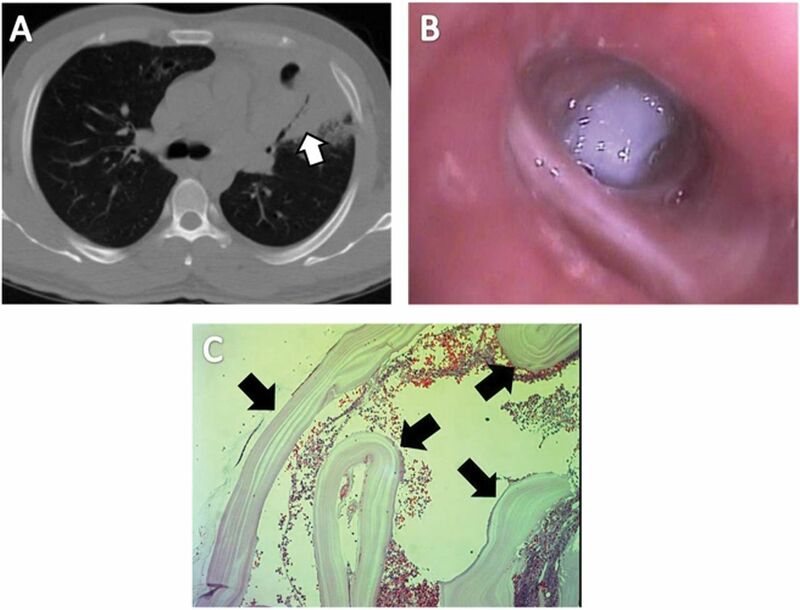 Pulmonary hydatid disease diagnosed by bronchoscopy: a report of three cases. Respirology 2009;14:141–3.
. Unusual presentation of hydatid cyst: diagnosis with bronchoscopy. J Infect Dev Ctries 2010;4:352–4. Acknowledgements I would like to thank Dr Munish Joneja for providing the pathology image.